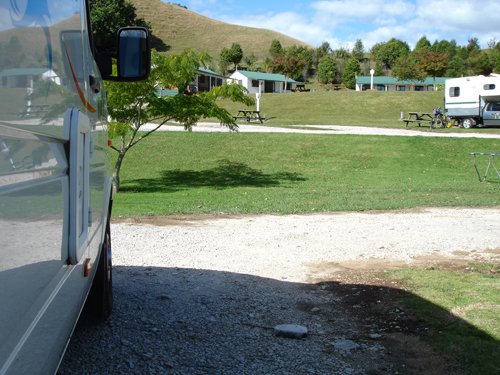 Here I am, grinding in the shadow of the campervan, in Waitomo. I have been visiting the caves to see glow-worms, and now I am hiding from a sun too bright for my pale blue gaze. The camp has wireless internet connection, and I can touch the web. I have been more or less randomly connected for more than a week, and in this time I have not missed the net once. What I have missed are the people I keep in touch with this way. There is a friend in Los Angeles waiting for me to send her my itinerary. There is an editor waiting for a book chapter. A colleague waiting for an article. A family demanding pictures – well, those find me anyway, as the demands tick in on my mobile phone. Is Lynsey in Wellington waiting for me at Blog Hui? I know he is, but does he have the program for the Hui? I am waiting for that. We are humans, communication is our survival trait. Without it we would have been eaten by everything from polar bears to maggots millennia ago. I communicate, therefore I am. Now, to ponder the presentation in Wellington.